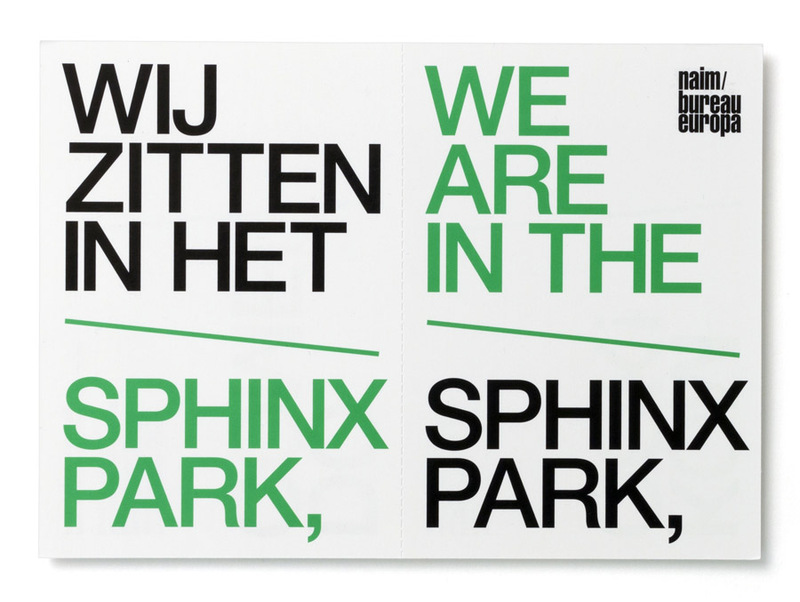 During the summer of 2012, the Maastricht-based institute NAiM / Bureau Europa were involved in all kinds of activities taking place in Sphinx Park, a temporary park in the centre of Maastricht. The graphic design of Sphinx Park itself was actually done by Karen Willey, so we had nothing to do with that. But NAiM / Bureau Europa did ask us to design a couple of items to announce their presence in the park, so we ended up doing a simple postcard, and some prints. These items were then distributed/shown in the building of NAiM / Bureau Europa, basically to instruct visitors to get to the park. In the same tone of voice, we designed a series of three posters; basically digital prints. We usually don’t feature digital prints on this website, as we don’t really consider digital prints (‘one-offs’) to be actual printed matter – to be honest, we feel digital printing simply lacks the stubbornness, longevity and tactility of silkscreen- and offset-printing (Debray speaks of the “delayed-action mechanism” of printed matter – this is roughly what we mean with ‘stubbornness’). Having said that, within this specific context, digital printing made sense, because only a couple of these posters had to be produced (they were displayed in the windows of the building of NAiM / Bureau Europa, to tell passers-by how to get from the building to the park). So to make a long story short, here’s the series of prints we eventually designed (A0-sized, digitally printed by Studio QS). First a poster displaying general information about the park, followed by a print giving specific instructions on how to get to the park, and finally a print showing a picture of the Sphinx Park itself (a photo made by Peter Visser). [Update: prints not shown here yet]. Sphinx Park was an initiative of ReCentre, Marres and NAiM / Bureau Europa, and took place from March 2012 to July 2013. For more information, check the website designed by Karen Willey.